Once upon a time a kingdom stood divided among the rule of three Alpha Monarchs. They were self serving dictators who cared little for those they ruled. Fear was their tool, cruelty their sword, and love a weakness to be denied. The Gods saw all of this and were not pleased, and so they allowed certain events to transpire. This is that story. 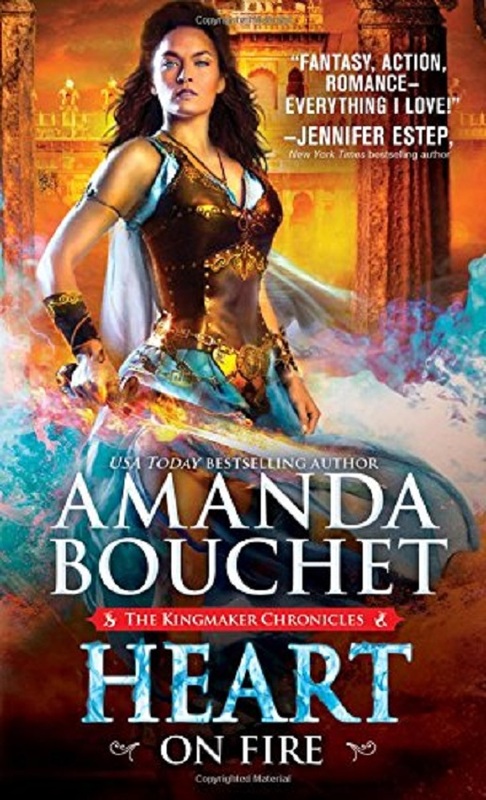 This is the third and final book of the Kingmaker Chronicles trilogy by Amanda Bouchet. I highly recommend you read both 'A Promise of Fire' and 'Breath of Fire' before starting 'Heart on Fire'. The books tend to build on one another and you'd miss out on a lot if you didn't read them in order. This Kingmaker Chronicles have some serious Greek mythology centered around a kick-@ss heroine that has to overcome her own fears and self doubt while trying to understand and control her powers. I loved seeing Cat grow into herself and finally understand the wizard's prophecy from years ago. The series is filled with Monsters, Wizards, Gods, Goddesses, and Greek mythology set in a different time and place from our own. Then there is beta team--the group that make up Griffin's and now Cat's inner circle. Every trial and tribulation this group went through brought them closer together as a family even though there were no familial ties. People often speak of life being like a woven tapestry. That we see only one side--the back of all the little patterns that go into it. It's not until we turn it around that we see how everything works and fits together, rather seamlessly, to create the true and final image and/or pattern the artist was working hard to achieve. That's kind how I felt this series took shape, and in this book we finally see the final tapestry and how everything was woven together. While we see everything as it happens, it's not until this book that we see how everything was carefully and purposefully planned to create something special. There were a lot of twists and turns thrown in that I probably should have seen coming, but somehow missed. I was pleasantly surprised and highly entertained by some of the big reveals. I couldn't help but give this one 5 out of 5 roses. I absolutely loved it. There were some loose threads with which the author could create a spin-off series from, and I wholeheartedly hope she does. I love all of Beta Team and would love to see each of them get their own happily-ever-after. Plus, I want to know what happened to a couple of the characters who where left in the care of some not quite human individuals. It seems there is more story telling to be done. Of course that may just be me and my wishful thinking. I'm crossing my fingers and hoping we haven't seen the last of this world. On the Lisarenee Romance Rating Scale, this one earned a SHOWER rating--a cold shower is necessary (need I say more?). Some books should come with a warning - make sure your significant other is handy or your shower is in working order. lol This series is definitely going on my keeper shelf. It's just that good. This is definitely a series I HIGHLY recommend.